Among the automakers, the automotive media, and the fans, new vehicles face great expectations from the moment their existence is revealed. Speculation and bench racing run rampant as we all try to infer from the available data how a vehicle should perform and how it will compare to the best in the segment. This prejudgment is no better illustrated than in the realm of sports cars, which brings us to these two perfect examples. Both the Chevrolet Corvette Z06 and the Nissan GT-R NISMO were among the most anticipated sports cars of recent years. The former sees a thoroughly improved chassis and interior matched to an even more capable drivetrain and suspension that promise to steal the mantle of supercar-killer from the latter, a no-holds barred rethink of the dominant supercar-killer of the past decade. Both cars promise performance normally reserved for cars two and three times the price, and both deliver in markedly different ways. Nissan's approach is by no means new but is less traditional than Chevrolet's. A twin-turbocharged 3.8-liter V-6 sends power to a six-speed dual-clutch automatic in the tail that then routes power primarily to the rear wheels but constantly monitors and redistributes torque to the front wheels as needed for maximum performance. The hand of Nissan's NISMO performance department can be seen in the car's increased output of 600 hp and 481 lb-ft of torque, along with improvements to the aerodynamics, the transmission, and the all-wheel-drive control systems. As it has from the R35 GT-R's beginning in 2007 (in Japan), Nissan has made continual improvements to the GT-R NISMO's complex software, even midyear. In this case, it means tweaks to the engine control software to eliminate a slight plateau in midrange power output, something we noticed on an early 2015 model we tested back in August. The result is plainly evident at the test track and from behind the wheel. From a standing start, the 3,881-pound NISMO hits 60 mph in the same 2.9 seconds but now finishes a quarter mile in 11.0 seconds at 126.6 mph, a tenth of a second quicker and 1.3 mph faster. What plateau?Good stuff, you say, but clearly the Z06's 50-hp and 169-lb-ft advantage coupled with more than 350 pounds in weight savings (at 3,527 pounds) should make short work of the NISMO. You would be wrong. The super 'Vette needs 3.3 seconds to hit 60 mph from a stop and 11.4 seconds to run the quarter mile at a trap speed of 124.4 mph. Z06 fans will no doubt notice that's a tenth of a second slower on both counts and 1.8 mph slower than the first 2015 Z06 we tested (MT February 2015). The reason for the discrepancy, we believe, is aerodynamics. The first Z06 was outfitted with the Stage II aerodynamic kit, but this car features the Stage III kit, which adds a significantly taller rear wing and front splitter extensions. Although good for high-speed handling, the additional downforce also means additional drag. As for comparing it to the NISMO, the 'Vette is hampered not only by its drag but also by its slower manual transmission and the need to put all the power to just two wheels. The 'Vette has other tricks, though. Its massive carbon-ceramic brakes; wider, stickier front tires; and lower curb weight all contributed to a significantly shorter stopping distance. From 60 mph, the Z06 needed just 91 feet to stop. The steel-braked NISMO needed 97 feet. However, these cars were not designed for drag racing, even if they happen to be quite good at it. These are street-legal track cars. They're made for corners, and they're very good with those, too. The NISMO's 1.03g average on the skidpad and 23.1-second figure eight lap at 0.99g average put it among the best cars we've tested. Although its figure-eight lap time was two-tenths of a second slower than the other NISMO, its 0.99g average was significantly higher and a new all-time best for the GT-R (up from 0.91). Both deliver performance typically reserved for cars two and three times the price. Sticky as the GT-R is, it's no match for the Z06, whose combination of speed and grip almost make it a record-breaker. As it stands, the Z06 is the second quickest car ever around our figure-eight course, bested only by the Porsche 918 Spyder. With a 22.3-second lap at 1.06g average, it's two-tenths quicker than the other Z06 and substantially grippier (up from 0.98g average). Tracking the data, we see the Corvette achieve higher speeds in the straights and brake later and harder than the NISMO, and it carries more speed around the corners. All this despite a frustrating but mild mid-corner oversteer that, if not managed, easily becomes a spin. On a simple skidpad, the Z06 again bests itself and solidifies its standing as the grippiest street car we've ever tested at 1.17g average, up from 1.16. 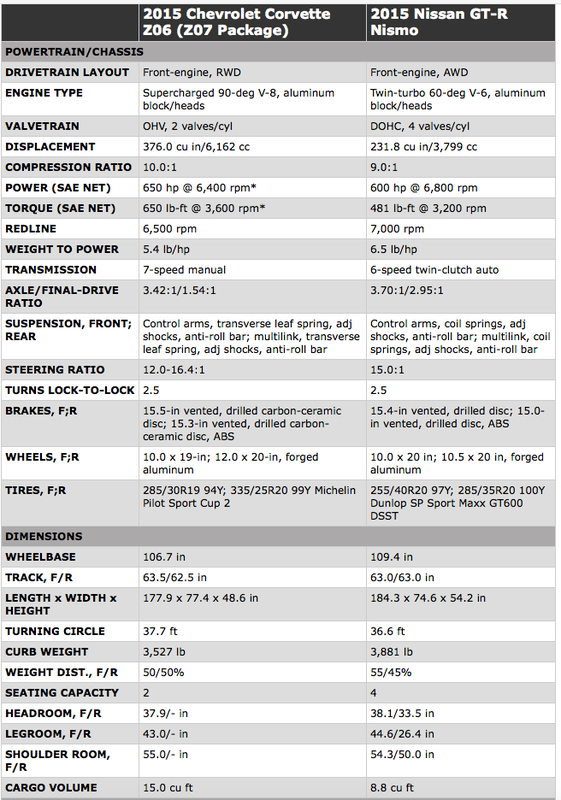 Unfortunately for the Z06, these numerical advantages don't play out at the racetrack. We brought the cars to historic Willow Springs to let their monstrous power and grip loose on the Big Track, colloquially known as the "Fastest Road in the West." At 2.42 miles, its nine turns run the gamut from tight and technical to high-speed sweepers, and its long straights let high-horsepower cars really stretch their legs. For this, we brought in our favorite pro driver, Randy Pobst, who turned an impressive 1:25.70 lap time in the NISMO but only a 1:27.10 in the Z06. How did that happen? We were as surprised as you. The Z06 has obvious weight, power, and grip advantages, and yet it lost by more than a second. In fact, it barely beat the even less powerful (and lighter) Porsche 911 GT3's lap time despite a whopping 175-hp and 326-lb-ft advantage. Here's what the data showed: The Z06 generally out-braked the NISMO and carried more speed through the middle of most corners, but the NISMO was back on the throttle sooner and carried more speed out. What's more, the NISMO was significantly faster on the straights, besting the Z06's top speeds by 6 and 7 miles per hour on the front and back straights. Best we can figure, the answer is in the aerodynamics. The Z06's big front splitter and vertical rear wing create downforce that helped the car carry more speed mid-corner, but the drag they create held it back on the straights. This wasn't an issue on the figure eight, as the speeds were significantly lower. To verify, we removed the clear Gurney flap center piece on the rear wing and had Randy give it another go. As we predicted, the Z06 picked up speed on the straights (1 mph greater top speed on the front straight) but lost time in the corners, where the reduced downforce increased the car's tendency to oversteer. Add to that the Z06's tendency to get hot after one lap and the computer's decision to reduce power to compensate, and you have a lap slower than expected. "It felt faster [than the lap time], but it also didn't feel like it had 650 horsepower," Randy said. "Just not as fast as I expected." He also griped it had "too much mid-corner oversteer, and the throttle is too sharp, so I can't modulate it like I want to." Then he said something we've never heard him say before: "I'd put some understeer into it. It doesn't understeer; the front has tremendous grip. I'd put a little understeer into it to settle down the rear." He followed that with: "On the laps where I used PTM (Chevrolet's Performance Traction Management), I found myself leaning on the stability control. I hate doing that, but it controlled the oversteer." He also preferred running the car in Sport handling mode rather than Track, as he found Track's suspension settings much too stiff. "It's beating me up out there, and this track isn't that rough." He did have nice things to say, too. "The brakes are phenomenal. The pedal feel, the stopping power, they're way better than the GT-R's." And: "The Z06 is more fun. It's a challenge. The GT-R is too boring. And I love the manual shifter. It's old-school. I'm old-school." He was less animated about the GT-R. "It just grips everywhere. They took some of the understeer out from the last one we tested. It's better balanced. I'd love to see some cup tires and some bigger brakes on it. It could handle them. The power delivery is better, too." The NISMO is all business, never evoking as much emotional response. With the shock of the track results still front of mind, Carlos Lago and I set off for one of California's best driving roads to determine whether the track results would be reflected in the real world. There it became a much closer competition. We hemmed and hawed, discussing how each car's strengths and weaknesses balanced out the other's. Lago figured he'd be quicker in the NISMO, owing to its incredible ability to pull out of corners at warp speed. To me, the Z06's better brakes made me more confident and allowed me to carry more speed into the corners, where the massive grip would carry me through quicker. The mid-corner oversteer that was so obvious at the track was nowhere to be found on the road. We agreed the NISMO's higher seating position gave better outward visibility but made the car feel more top-heavy and imparted the sensation it was rolling over much more than the lower, racier Z06. It was also hard to ignore the NISMO's extra weight, both under braking and in corners. In the end, we agreed the Z06 was slightly more fun to drive thanks to the involvement of its manual transmission, its sportier seating position, and vastly superior soundtrack. When it came time to make the long drive home, it was an easier decision for me. The Z06's third-generation magnetorheological shock absorbers remain the best in the business and make the car a far more comfortable ride on the street than the stiff NISMO, even with that car's Comfort suspension setting. The NISMO's insistence on chasing every single groove in the pavement also gets old quickly. Sure, the Z06's manual transmission was more work in traffic, but a reasonably light clutch made it mostly a non-issue. More frustrating was the heat radiating through the firewall and center tunnel when stuck in traffic; it cooked my feet first and then heated up the whole cabin. At freeway speeds, there's enough airflow under the car to keep it in check, but at rush hour, there's nothing you can do but turn up the AC while you creep along. When it came time to tally up the score, we found ourselves with a doozy. The Z06 is better in everyday life and performs better around a corner. The GT-R is faster at the track and in a straight line. The cars are about equal on a good road. How do we choose? I put it to Randy first, asking which he liked better. His answer: "The Corvette. The GT-R is too boring in its efficiency (on the track). But if I wanted to set a lap, I'd take the GT-R."
It's where we ended up, as well. We had a bit more fun in the Z06, but we know the GT-R is the superior track machine. If this were Best Driver's Car, the Z06's more engaging and rewarding driving experience might tip the scales, but it's not. These cars are built for the track, and the GT-R does it better, though Chevrolet is to be roundly commended for what it's done at two-thirds the price. The GT-R costs significantly more, but you get what you pay for. What really clinched it is that despite the price difference, the NISMO actually is doing more with less. It's working with an older chassis, significantly more weight, less powerful brakes, less tire, less power, and much, much less torque. Despite all that, it's as quick on the road as the Z06 and trounces it on a racetrack. For surmounting such massive obstacles and not only meeting but also exceeding the Z06's all-around performance, the Nissan GT-R NISMO is our winner by the smallest of margins. When we overlaid the plots of the Z06 and GT-R’s best laps, we all sat back, briefly confused. Is the Nissan really that much faster at higher speeds? Does the Corvette really outgrip the GT-R that substantially through the long Turn 2? The data doesn’t lie. (We simultaneously record these laps with two different Vbox data loggers precisely to keep them honest.) But on both the front and back straights, the Nissan clearly had the legs on the Chevrolet. Gearing? Aerodynamics? Heat buildup? Meanwhile, the Corvette’s big Turn 2 cornering edge quickly degraded during subsequent laps. Was heat generation in its tires rocketing their pressures? And notice, too, Randy Pobst’s pause between Turns 4 and 5 in the Z06 (avoiding a time-eating gear shift) and his dramatically early braking before Turn 9 due to a lack of total confidence. Often comparison lapping days such as these leave us frustratingly short on time to unravel all the underlying puzzles. But we know for sure that despite all the back and forth in the speed graph, the GT-R quickly grabbed a small lead on the Corvette and held it all the way to its 280-foot advantage at the finish line. Last edited by EKaru; Mon, Feb-02-2015 at 01:20:27 PM. Wow - GT-R still king at the track. On another note, both of those interiors look atrocious to me. In before the "I'd rather have a GT3" crowd. BTW, I did not expect the Nismo to put the hurt on the Z06. Is it really that much better than the standard GT-R/GT-R track pack? 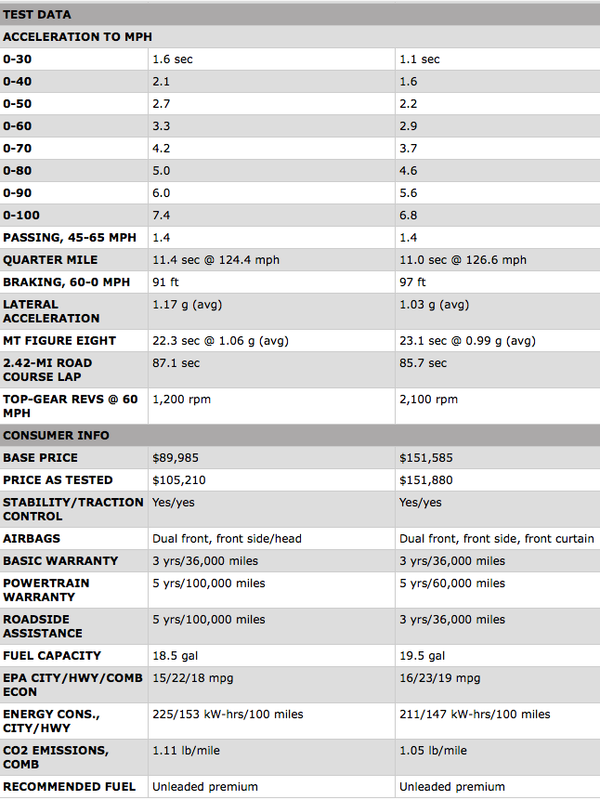 There is actually a pretty significant list of upgrades on the Nismo, plus you are paying a premium on exclusivity. I have not seen the price of these cars come down. The average 911 buyer is a suit-and-tie-wearing, power-brokering status type more concerned with a perfect business deal than with a perfect heel-and-toe downshift. I hate to say it because I was really excited when this car first came out and info started getting leaked, but I am left a little cold by this new z06. its too heavy for what it is (basically same weight as my m3 which is big and has 4 doors and all kinds of tech), and the car seems to be plagued by some heat management issues which is disappointing. I still find myself lusting over the prior gen z06 as I think it looks better, sounds just as good and is much less expensive. And the GTR is insane on track. If you encounter one with a good driver on a local track, they are the fastest thing out there. None of us are Randy Pobst, so they still require a good driver and when driven well, they are fun to watch on track. They also sound really good with the right mods and especially with a titanium exhaust. This gen Corvette may have an "improved" interior over the last gen, but it is still pretty bad. Can't outrun a GT-R in a single lap race. I don't think the C7Z has beat a single car. All times are GMT. The time now is 06:22:38 PM. Discussing Motor Trend: Nissan GT-R Nismo vs Chevrolet Corvette Z06 in the Off Topic Forum - Place to discuss this and that. Note: We also have "request to join" forums: Guns and Fitness.